A 250 round case lot of ammunition for the clay shooting competitor out there that needs a bit of respite for hammered shoulders and from punishing shotguns. 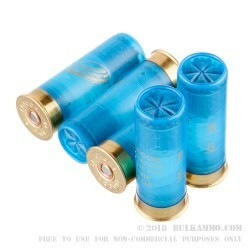 This is an officially endorsed ammunition for the PSCA (Professional Sporting Clays Association), which means it’s well used by competitors in the know for what works and what doesn’t from a competition perspective of many hours of shooting a week, with an ammunition that must simultaneously be comfortable to shoot and perform on target. 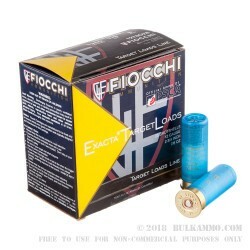 It is no surprise that Fiocchi is the company producing this ammunition, because it is their innovation and ability to produce such a wide range of ammunition offerings, especially on the shotgun spectrum, that usually shines through a largely mundane market selection. 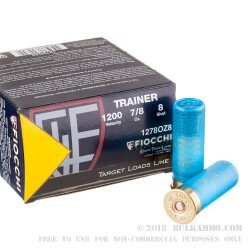 This 250 round case is very nicely priced for those competitors that need a mildly recoiling shell for constant practice on clays and in other competition formats. 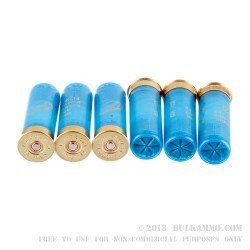 This standard sized shotgun shell (2 ¾”) is packed with a 7/8 ounce payload of #8 shot which features a very mild recoil profile. The shell will function in any firearm that is a mainstream unmodified weapon, or in many guns with light springs.